You'll want to start by thinking up a theme for designing your basket around. A theme could be a character the Mama-to-be may like, a animal or object, a color scheme, or a concept. For instance maybe the mom-to-be really loves Classic Winnie The Pooh. You could design an entire gift basket with classic Pooh items right down to the basket itself. Or maybe something more simple like puppies, teddy bears, or flowers. Flowers are a great theme as you could fill in the basket with little baby sock roses. A color scheme is easy, pink for girl, blue for boy, green or yellow if gender is a surprise. Or simply go with the happy couple or Mom's favorite colors. Fill it with shades of this color and maybe some accents of colors that go well. Or you can go with a concept, such as baby bath, or baby bedtime. A baby bathtime basket could be filled with soaps and lotions, baby towels and face cloths. A baby bedtime could have baby blankets and sleep sacks, footie pajamas, a cute teddy, and a couple of children's books for reading before bed. While making your baby gift basket you will certainly need to pick some appropriate items to fill the basket with. You will want to choose theme appropriate items to go with your color scheme, character, or concept baby gift basket. To make a baby gft basket that is eye catching and pleasing it works best to pick several items that vary in size. It is also a good idea to purchase a few items to use as filler and also some tissue or wrapping paper. By filler I mean items such as receiving blankets, onesies, or even baby wash cloths or burp cloths. These are great to fold or squish up to stick in the basket to hold certain items up in certain angles or positions. You will want to arrange the items in the basket in a way that looks pleasing to the eye and not just jumbled and thrown into the basket. By adding the filler and tissue paper you can be sure to have some control over how the items sit. I always like to add a little extra something to the basket itself. 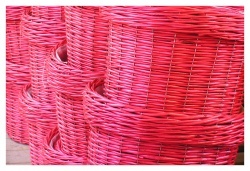 If you happen to have found yourself a unique or striking looking basket then you can pretty much skip this step, but any plain old wicker basket could use some sprucing up. I always like to add a nice big satin bow. If you are willing to spend a little more tying a rattle or some pacifiers into the bow is a good idea too. A nice fancy gift tag can really add some flair to a basket as well. You can sopmetimes buy tags like these at paperies or boutiques, but I like to just make them myself. I use a big paper punch or buy an oversized blank tag, and then use rubber stamps and ink to stamp a cute image to the tag. I add glitter, chalk, rhinestones, anything I can get my hands on to create a beautiful handmade custom gift tag. It's a fun activity and show's you care as well. Create A Unique Baby Gift Basket! Making a baby gift basket gives you the freedom to take the reigns and go in any direction you may want. So why not create a one of a kind and unique baby gift basket? * Use a unique item for your "basket". Why not fill a baby tub? Or a bouncy seat? Think outside of the box and go for something different! * Choose unique items that to fill your basket. Or a unique theme. Why not fill a basket with a bunch of monogrammed items or fill it with different colored onesies featuring all of the baby's parents favorite musicians. However you go about making a baby gift basket for your friends or families impending arrivals, just know that they will absolutely love their new unique baby gifts, because YOU MADE IT! I don't know a person on earth who doesn't appreciate the effort you would put forth and it really shows how much you care and think of them! Have a great time making your baby gift baskets everyone!